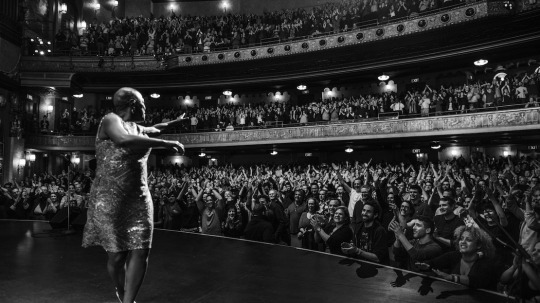 Beg borrow and steal to get a ticket to Thursday night's screening of MISS SHARON JONES! at DOC NYC. Not only is it a great film but the woman herself and the Dap Kings will be there. The film is a biography of Jones and her group that is wrapped around the story of her battle with cancer in 2013. The film is full of music and it takes the story up to earlier this year when Jones performs in Augusta Georgia before a huge crowd. One of the most joyous films I've seen at DOC NYC so far this is a film that will lift you up and make you feel good. First and foremost it will tell you the story of Jones who was once called too short, too black and too old to be a singer but who has fought her way to the top of her game where she is loved and adored by millions and including her peers (I saw her play with Prince and she was probably better than his royal purpleness). At the same time we get to really know Jones, a glorious woman who you want to to just hang out with. Jones is an amazing woman who gets pissed when she can't have dinner with the boys, goes fan girl when she meets James Brown and simply wants to dance with Ellen DeGeneres. This is a film that will make you want to stand up and dance all through it and cheer when it's done. This is a super film uses its straight forward approach to tell the story of a great woman and a marvelous entertainer as she struggles to over come her illness and get back to doing what she loves. I have nothing else to say other than make time and get a ticket and see this film. aw man. bummed i missed the press screening of this! i can't make it thursday, but hopefully it will get a wider release! sounds great!